Top Rated and Excellent Dental Practitioners! Why use over the counter whiteners for weeks at a time, when you can get the same out of one visit to the dentist? At Retro Dental Broomfield we have the best teeth whitening products available for use at home, as well as professional in-office teeth whitening administered by our experienced staff members. Professional teeth whitening systems are much more powerful than those you would get at a local drug store; not to mention that the whitening chemicals are applied by a dental professional. If you don’t want to spend time in our Broomfield office to get professional teeth whitening services, then you can take home a whitening kit with custom bleaching trays. We have many options for you to find the best solution to give you the bright, white smile you are seeking. If you have any questions about Broomfield dental bleaching or other dental services, call us at (303) 466-2935 and schedule an appointment today. 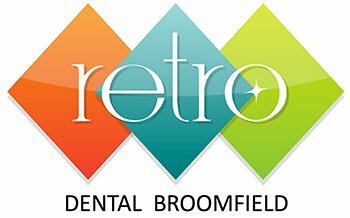 Our team of experienced professionals at Retro Dental Broomfield provides you with the quickest, easiest and most affordable options to give you the smile you have always wanted. That’s what everyone is looking for in a dentist, right? That’s why we offer you options to get your bleaching done professionally with one stop and you are done; or to take home bleaching kits for your convenience that have dental grade peroxide for effective stain removal. When using over the counter products, it is easy to use too much product that will eat away too much of enamel on your teeth. This results in permanent damage to your teeth. Trust us to remove those awful stains caused by tobacco, coffee, cola drinks, blueberries, cigarettes and other stain prone objects in a safe and effective manner. If you are considering Professional Teeth Whitening in Broomfield, we can give you tips on how to keep your teeth from staining in the future, so that the new smile you have is always on display. Don’t let money be an issue when it comes to helping yourself to the smile you have always wanted, because we have many options to make teeth whitening affordable and easy to obtain. Give us a call at (303) 466-2935 to schedule your appointment for a Broomfield dental bleaching or click the ‘appointments’ button below.